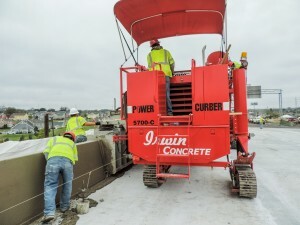 The Tennessee Department of Transportation (TDOT) recently completed the Fast Fix 8 project in Nashville, and Power Curber owner Irwin Concrete Construction was right in the middle of this high-profile job. 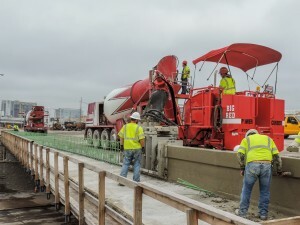 TDOT’s goal was to replace eight aging interstate bridges along Interstate 40 through Nashville using a process called Accelerated Bridge Construction (ABC), which uses fast-paced, around-the-clock work to limit road closures and speed up bridge completion, impacting surrounding communities as little as possible. 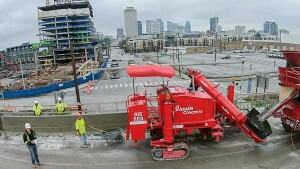 The Federal Highway Administration, a division of the US DOT, estimates that approximately 25% of bridges in the US are in need of rehabilitation, repair, or replacement and are “structurally deficient.” The bridges over Charlotte Avenue, Jo Johnston Avenue, Clinton Street, and Herman Street in downtown Nashville were built in 1968 and in 2013, chunks of concrete began falling from the Charlotte Avenue overpass, causing road closures and concerns about the safety of the downtown bridges. The Fast Fix project was schedules for 13 nonconsecutive weekends, where both directions of I-40 were closed from the I-40/I-65 split west of downtown to the split south of downtown every weekend to allow crews complete access to replace each bridge. 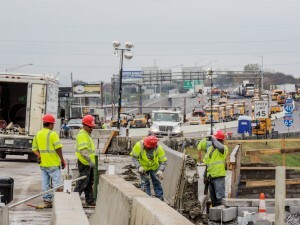 The interstate would close on Friday night after rush hour, when crews would begin demolishing the existing bridge. 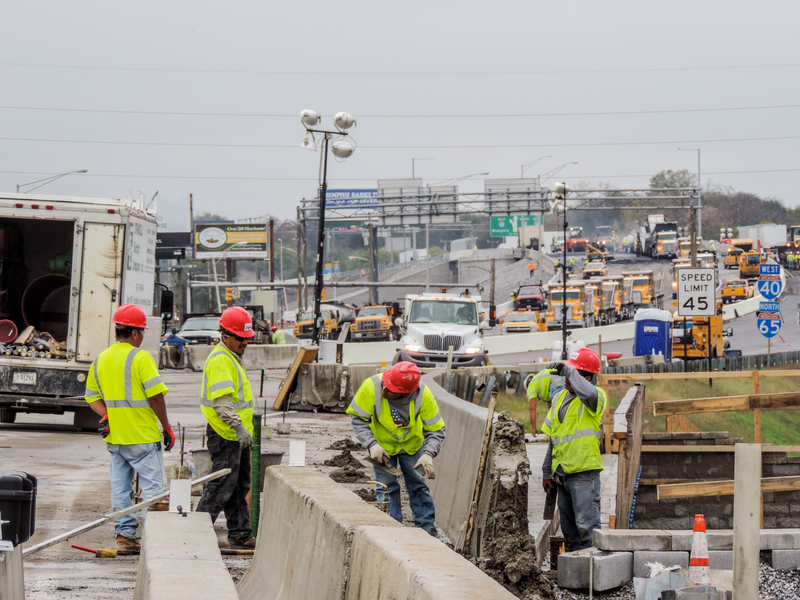 Working around the clock, new beams and precast bridge deck sections were installed and temporary precast barrier and parapet walls were put in place. 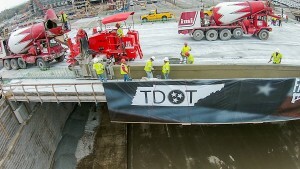 The bridge would reopen to traffic in time for Monday morning commuter traffic. 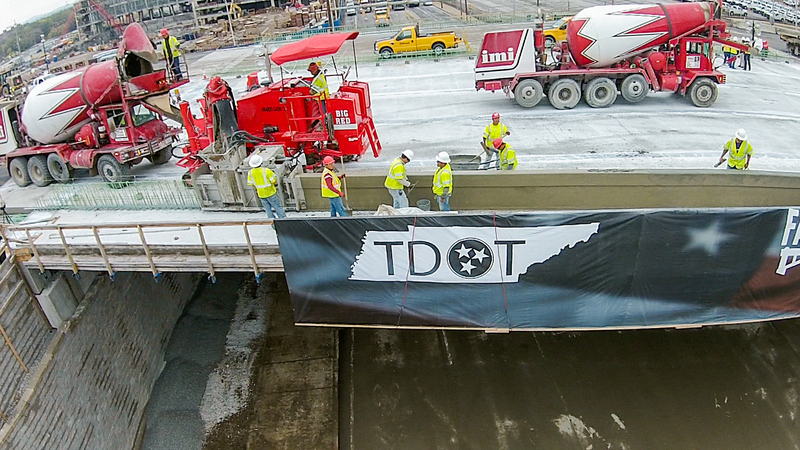 “Coordinating with all parties and having the interstate opened to traffic on Monday at 6 am was the biggest challenge,” said Lia Obaid, TDOT Construction Assistant Director. 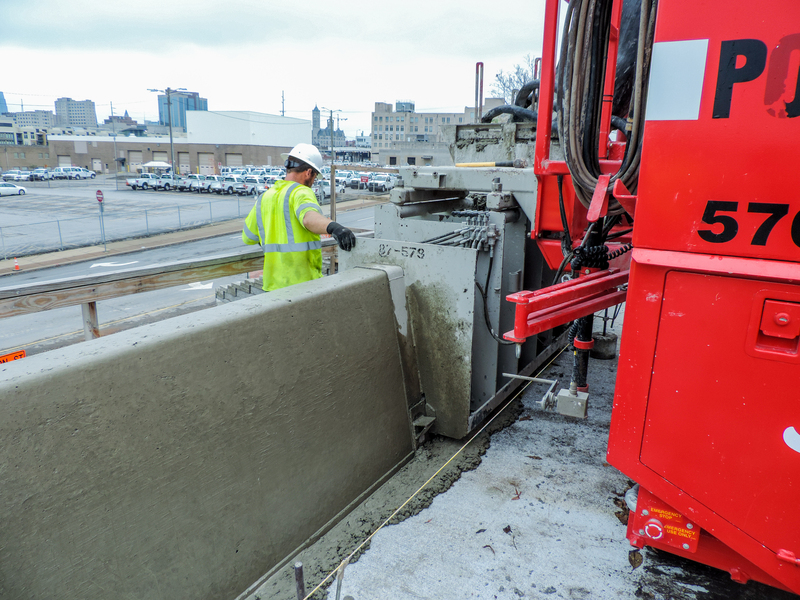 The following weekend, or sometimes overnight during the week, the final finishing would be done to the bridge, including slipforming the permanent barrier and parapet walls. That’s where Irwin’s team came in, joining their first ABC project. “If you can go in there and demolish a bridge and put it back and have traffic back on it in 48 hours, you’re doing a pretty big thing,” said Irwin’s superintendent Stonie Garton. 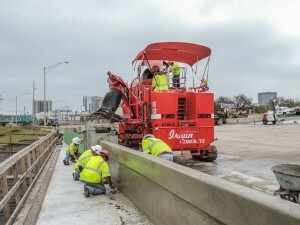 Irwin’s crew poured approximately 3,000 feet of 35″ side parapet and 32″ median barrier for the newly-constructed bridges with their 5700-C.
With good planning and a lot of hard work from groups like Irwin’s, the $62-million Fast Fix project was completed in only 6 months with only 10 weekend closures instead of 13, which put the project 7 months ahead of schedule. Advances in roadbuilding technology, including slipformed barrier, have changed the way DOTs approach large-scale projects. 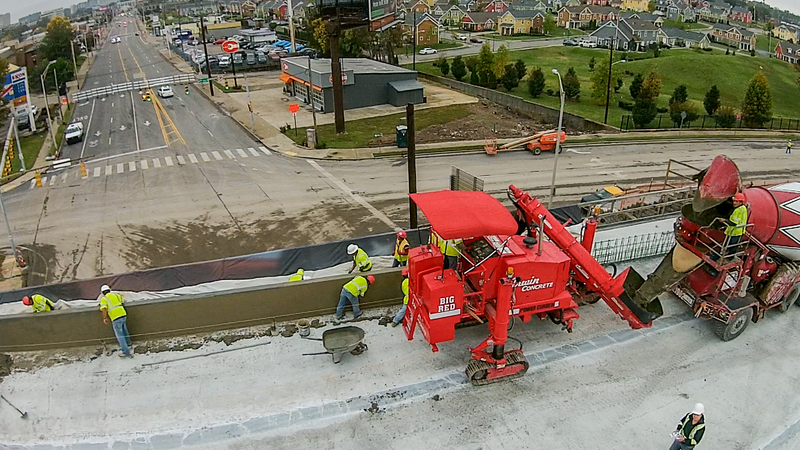 “It improves site constructability, total project delivery time, and work-zone safety,” says Obaid. 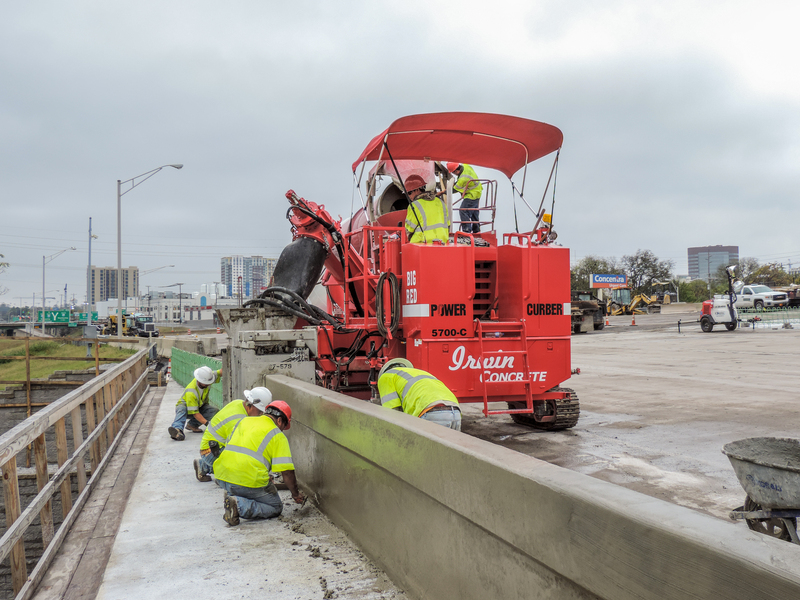 As for the Irwin team, being part of such a tightly scheduled project meant there was no room for machine breakdowns on the job. “Without the Power Curber we would never have been able to meet such tight deadlines. 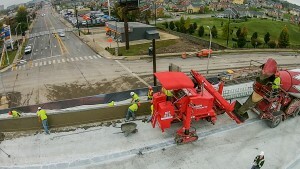 The job would have been impossible if we’d had to handform all those walls,” he said.